Bath at War is a video filmed by 1st Take Video, a Bristol company which specialises in West Country local history videos. 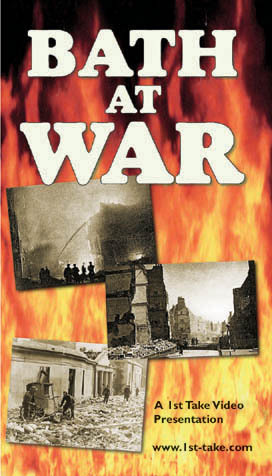 This video, available either on VHS or as a DVD, provides a moving account of the bombing raids on Bath during World War Two. Each video sold will contribute to Project funds, and any income beyond the Project's needs will be passed on to the Royal British Legion. Bath's civilian population was subjected to one of the fiercest onslaughts carried out against the West Country, enduring three attacks spread over just two nights in April 1942. During that short period the Luftwaffe ravaged the city, bombarding it with both incendiary and high explosive bombs, as well as machine gunning the streets to hamper the work of the emergency services. This video contains not only the harrowing recollections of the dwindling band of survivors, but also commentaries and reconstructions by leading local historians. Many locations in and around the city are visited, and the story of Bath at War has been brought to life as never before by the inclusion of rare contemporary film extracts, photographs and documents from both British and German archives. Originally issued as a VHS video, it was later reissued as a DVD with the same content. Both formats are still available. The retail retail outlets in the Bath area that normally stock 1st Take products and will either have stocks of the video or will be able to order it are: Whitemans Book Shop in Orange Grove; the Post Offices in Combe Down, Moorland Road, Lower Weston, South Twerton, St James Square, Yomede Park, Timsbury and Peasedown St John; "News For You" in Moorland Road; W H Smiths in Union street, Bath; W H Smiths in Bristol, at Kingswood, Cribbs Causeway, and "The Galleries". 1st Take stockists elsewhere will be able to order it. Most of Bath's libraries bought copies of the video (though not the DVD) for resale, so you could ask there if they have remaining stock. The Victoria Art Gallery bought a stock of the DVD (though not the video) for resale during their "Blitzed!" exhibition in the summer of 2005. While stocks last, they can supply to personal callers to the gallery. The video or DVD is also available by mail order from 1st Take Video. The mail order price will have postage and packing added to the product price, so please check the total cost before ordering. 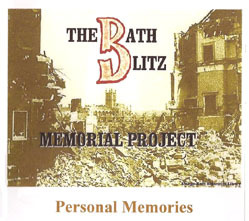 Bath - a Journey Through Time covers a wide time span, but over half of the running time is devoted to the aftermath of the Bath Blitz. Archive footage of wartime damage is fairly rare. In order to maintain public morale, news and photographs showing the true scale of the damage were rarely published, and photographers, aware of the censorship, tended to use their scarce film on pictures that they knew could be used. Colour film was particularly scarce. What there was was almost entirely devoted to wartime use, and the public regarded it as unobtainable. But the archive footage in this video is in colour, and the photographer has roamed the streets of Bath with a cine camera filming the damage. Available on loan from Bath Central Library. Available for purchase by Internet order from Video by Design. Click here to go directly to their ordering screen. 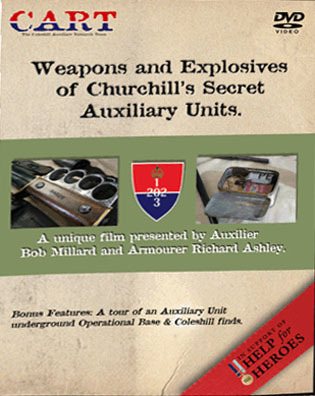 Weapons and Explosves of Winston Churchill's Auxiliary Units gives you a detailed insight into the weapons and explosives used by Winston Churchill’s Auxiliary Units as well as SOE and other units. Presented by a weapons expert with 55 years experience, and a former member of the Auxiliary Units who used most of the weaponry featured, this DVD gives a rare insight into one of WWII's greatest secrets. Also on the DVD are bonus items on an Operational Base and how it was used, plus a tour of the grounds of Coleshill House showing artefacts that have survived. Available for purchase by Internet order from the CART Website. Click here to go directly to their product description and ordering screen. Each purchase makes a £1 donation to Help For Heroes. If you watch the DVD and find the subjects interesting and want to know more, take a look at the CART Shop Page which lists other books, DVDs and memorabiliia available (mostly from Amazon). In preparation for the 60th anniversary of the blitz, the Project created a video for sale in aid of Project funds. John, a boy of 11 during the raids, describes the destruction of his family's home and his subsequent move to the countryside -- and a chicken coop! This video offered a unique opportunity to see and hear Bath Blitz survivors speaking frankly and with humour about their personal experience of the war. 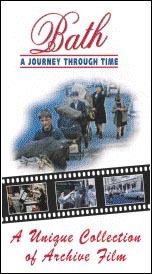 All copies of this VHS video had been sold out long ago, but for the 70th Anniversary event the content has been reformatted as a DVD which is now on sale at the Museum of Bath at Work.